Can you believe it's October already? I can't, but I look forward to my favorite season....autumn. 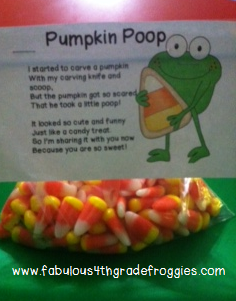 This is a fun treat to give your students, your co-workers, or even the trick or treaters coming to your house. These treats also make a fun party favor if you have a fall birthday. 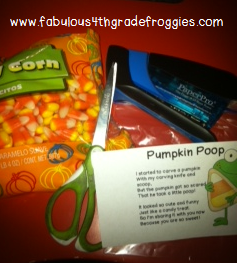 Instead of candy corn, the mellowcreme pumpkins or orange jelly beans can be used.